Stuck with ideas for my next blog for Cafe Reality, my wonderful mother calls and tells me about their trip to a restaurant in London called Shaka Zulu. Immediately intrigued, thinking that the restaurant was named after my grandparents’ dog, Mother explains that it is named after the great South African King of the Zulus. My grandparents’ dog was obviously named after this legend which would make more sense! The restaurant is themed around the South African King and heritage relating to the country itself. This is all achieved by the use of textures, colours, statues and of course the food. 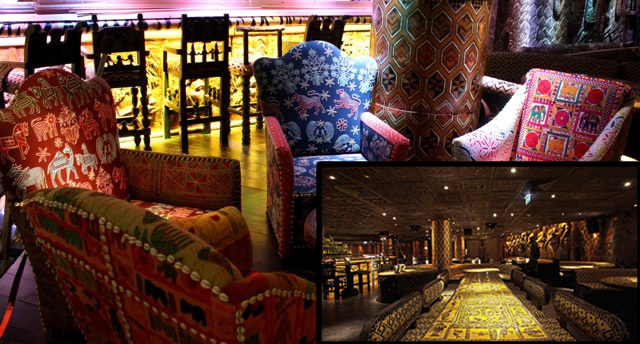 Opened in August 2010, 182 years after the death of Shaka, the restaurant is located proudly in Camden, London. It is now a popular destination for parties, meals and social gatherings. The main feature that was the most striking for my stepfather was the “snakeskin-effect sinks”, showing the level of detail that the designers went through to ensure that the African heritage is prominent. The level of detail can also be seen in the upholstery. He explained that “All the furniture is made from animal skins”, showing that the designers were also keen to make sure that homage is paid to the animals in South Africa. The animals play a large part in the pride of Africa. I remember learning about how the animals held significant importance when I lived out there as a very young boy (all those years ago). Wasn’t too keen on the snakes that used to enter the classroom though! Not only reminding native South Africans of home, but also reminding us, as a family, of our own heritage. As a lot of “earth” colours are used with the brighter shades of colour, the environment creates the sense that you are on Safari and allows you to forget that the Underground is only a short walk away. The beautifully titled menu “Essence of Africa”, allows you to enjoy various braai (barbeque) dishes, again reflecting the colourful African culture. Ranging from Boar and Ostrich Terrine, Venison Carpaccio, Zebra steak and Buffalo Short Rib, so there are plenty of exotic dishes to choose from! And yes, there are also some fantastic vegetarian dishes which sound divine! I guess the only thing to do now is ask where my invite was?! Alternatively, get a table booked up and try it all out yourself!